Fill pool and spa to the normal water level - turn auto-fill off. 1. Fill a 5 gallon bucket with water 2"-3" from top. 2. Place on the first or second step in the pool or spa. 3. Mark the level of the bucket's water inside the bucket. 4. Mark the pool water level on the outside of the bucket. After 2-3 days, mark the new water levels & compare the water loss. When your pool or spa is losing water at a rate more than normal, it may be time to hire a professional company who can locate the source of the water loss. At Spectrum, our technicians utilize the best in leak detection equipment to find and repair the structure or plumbing and get your pool system back to health. Expertise comes with experience, and Spectrum has been providing swimming pool repairs to our clients since 1984. Always hire a professional when spying out your leak, as specialized tools accomplish the job with better accuracy. We have listening devices, pressure testing, and dye application - all helpful to find your leak. Losing water in your pool structure or plumbing requires fast attention in order to minimize the depletion of chemicals and to mitigate underground damage. To initiate the process, contact our office and schedule an on-site evaluation to discuss our procedures and tools proprietary to our industry. Sonic testing is a reliable procedure to locate water loss in underground plumbing. This can be successful because a highly sensitive microphone can isolate and pick up a targeted sound that appears when water and air are forced through a pin-hole or crack. Other techniques utilized are visual, dye, and 'bucket' testing. A leaking pool can cause many problems inadvertently. For instance, water loss will result in chemical imbalances that is difficult enough to achieve in normal circumstances. As soon as you notice that you are adding water nearly every 2 days or so, give us a call to discuss the problem. We're here to help. Maintaining proper water levels in your pool and spa are important when evaporation will deplete levels each week. Typically utilizing a garden hose or water fill valve, mid-tile line grade can be maintained fairly easily with a check one time weekly. When that is not enough or a change is noticed, it may be time to do a bucket test. Automation helps to make your pool a pleasure, however, adding water can be tricky. Either do this as needed with a garden hose, or you may already have an autofill device installed. Either way, water can escape and require special service to find out where. Spectrum is capable to do just that - so let us know your needs. When we dispatch a service technician, we arrive at the property prepared to plug lines, listen in with a special sonic device to hear fine air bubbles underground, or donn our diving gear and search the pool surface for plaster cracks or other areas of compromise. 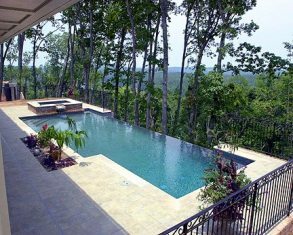 Call for your quote, as each pool is unique with several pump systems. Whether you live in Santa Monica, Bel Air or Studio City, Spectrum leak detection experts can locate and repair your pool system. Many techniques are used in a methodical way so that we can be efficient and accurate. We can discuss the simple test that you the homeowner can do on site that may save a service call charge. Finding a leak in a pool or spa can be quite daunting without the requisite experience and techniques to apply. We have both, and are available to solve your water loss dilemma this week. Simply call our office and we will discuss our fees and set up an appointment at your convenience. Swimming in a pool that is losing water is no fun at all. If you notice that you are adding more water to the pool than normal, then it is likely that the structure or plumbing has a leak. Always check above ground for the obvious, but if in need of a professional, you can give us a call and we will be able to help. There is no shortage of phone calls to our office regarding water loss issues. That is because our pool structures are subjected to earth movement regularly, and the pressures will cause plumbing and gunite to crack. Our leak team is trained to locate the rupture and propose a repair. Water loss is a regular issue here in Southern California due to the seismic activity we experience. The pressures on the gunite and rebar, as well as plumbing, result sometimes in rupture and then leakage. Special detection equipment is employed to find the leak and then repair. We at Spectrum are ready for your call. Our customers receive qualified and experienced leak detection pros from the Spectrum Pool Care team. We utilize best industry practices from beginning to end, accomplishing repairs and upgrades for our clients over the past 24 years. Call us for an appointment today. Water loss can happen to any pool or spa structure at many points such as the light fixture, return line fittings, main drains, skimmers and through gunite surface cracks. Hire a professional team with pressurized, sonic, and dye testing to find the breach, and we'll detail a repair solution as well. Here in the San Fernando Valley, our team of leak-finding professionals utilize pressurized plumbing, dye testing, and sonic listening devices to locate where the water is escaping from your water feature. Whether you have a pool or spa, leaks can appear. Always check first above ground for any visible leaks before you make your call. If you live in the Conejo Valley and have a water feature in your backyard, chances are that a repair may be needed periodically. When you notice that you need to add water to the pool more often than usual, then you need to consider that it may be leaking from the structure. A professional leak detection will be able to locate it. Water loss in a pool or spa can cause secondary effects as it leaves the pool plumbing or structure and enters the surrounding earth. It is important to stop any leaking, whether abover or below ground, as soon as possible. Spectrum's repair team is quick to spot and repair equipment or plumbing issues, just give us a call for fast service.